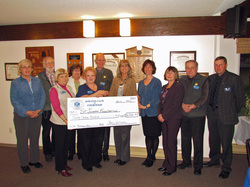 The Kiwanis Club of Courtenay's Annual General Meeting was held on June 19th. Roderick Grenouille was awarded the 2013 Kiwanis Foundation of Canada $2000 Bursary at a recent meeting. 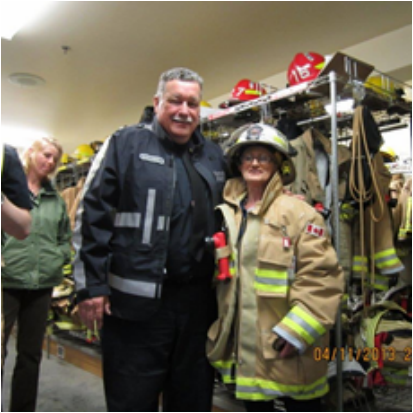 Roderick attended Isfeld Secondary School in Courtenay and is now attending North Island College. He is interested in following a career in Aeronautical Engineering. Jillian Thompson was awarded the 2013 Kiwanis Foundation of Canada $2000 Bursary at a recent meeting. 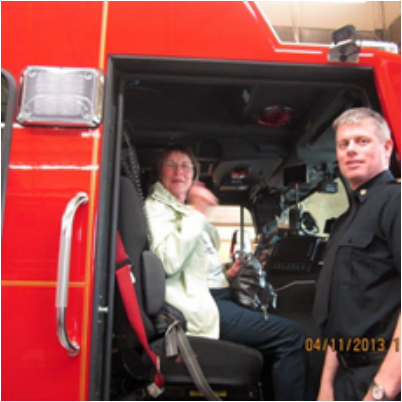 Jillian attended G. P. Vanier Secondary School in Courtenay and is now attending North Island College. Malinda Schenker was awarded a $2000 bursary to attend North Island College in the Human Services Certificate program (Education Assistant). Andrea Daugherty was awarded a $2000 bursary to attend North Island College in the Human Services Certificate program (Education Assistant). 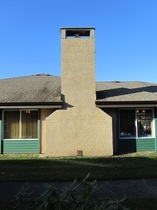 This chimney (which is no longer needed for the original wood fireplace, which has been replaced with a gas fireplace) was deemed a hazard in last fall's Emergency Preparedness study. It was highly likely the concrete chimney would collapse in any sizable earthquake and crash through the roof into the Social Hall, which is the Emergency Preparedness meeting area. The top of the chimney was removed on May 10, 2012 down to roof level. The vent for the gas fireplace will be installed by the end of this week (May 11). 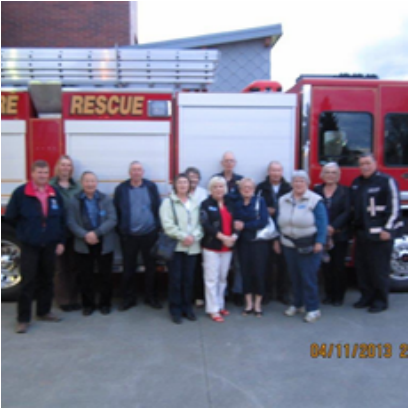 On April 21st, the Kiwanis Club of Courtenay, BC presented a check for $6,700 to St Joe's Foundation for the purchase of Pediatric Department supplies and equipment. Shown in the photo are Regina Land, Hartley Rollins, Wendy Harris, Alma Williams, Louise DeArmond, Bill Thomas, Lynn Dashkewytch (St Joe's Foundation), Jennifer Moses, Bernice Dueck, Lee Rogers, and Andy Quinn. Louise DeArmond was responsible for the project, bringing the Singalong version of the Mamma Mia movie to the Sid Williams Theatre and a sellout audience. Kiwanis Children's Cancer Program, KCCP, will help support three Children's Cancer Fellowships programs in the Pacific Northwest. Doernbecher Children's Hospital Portland Oregon, Seattle Children's Hospital, and BC Children's Hospital in Vancouver, Canada. One of the fundraising projects in British Columbia is Ton of Pennies, encouraging people to donate all their pennies into jars conveniently located in a number of locations. Pat Lt. 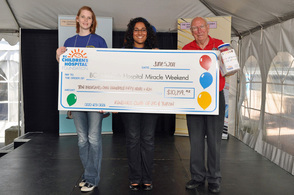 Governor for the Pacific Northwest Division, Cliff Fletcher, is seen here presenting a check at the BC Children's Hospital Miracle Weekend. A great evening at the Sid Williams Theatre. A full house and the film was enjoyed by all. Many of the audience dressed up in costumes from the times.